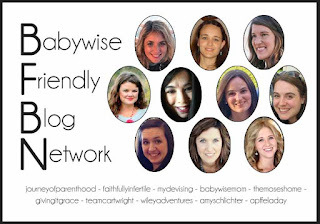 This week the ladies of the Babywise Friendly Blog Network are all writing on the topic of sleep. Below is the schedule of blog posts for the week. There will be heaps of great content shared across the all the blogs, so be sure to follow along! Shea from The Moses Home is talking about the importance of protecting baby's 1st nap of the day. She talks specifically about how the first nap is crucial to setting the stage for good naps the rest of the day, which we certainly found to be true with our son. This is a classic Babywise concept worth employing. Enjoy!